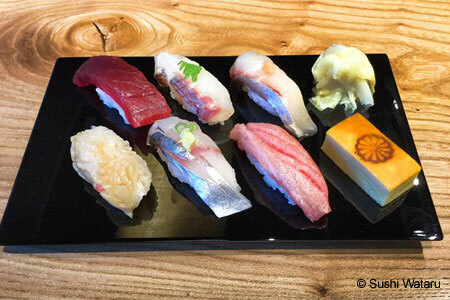 A seasoned chef presents sushi with traditional style and finesse in Ravenna. : On the lower level of a mixed-use building, with bare bones decoration and only a small sign, Wataru’s low-key appearance belies its dining experience. At the six-seat sushi bar, seasoned sushi chef Kotaro Kumita doles out a parade of nigiri sushi, each piece more impressive, fattier and flavorful than the previous. Omakase (chef's choice) at the sushi bar is an interactive experience, with Kumita reading his audience the same way a pitcher watches the batter, serving up each item at the precise right moment. For those outside the coveted sushi bar, the menu offers a smaller version of omakase, plus a basic assortment of rolls. Fresh fish and Kumita’s skill with traditional styles, such as zuke, set Wataru apart. The spare menu features a few wines and an assortment of saké, and the friendly, if slightly sluggish, service is helpful in choosing the right beverage. Sushi is the star here, but if your sweet tooth calls, there are also a few Japanese-flavored ice creams available.